I went through a pretty lengthy period of my life certain that I was an extrovert; I mean, I had been a fast-talking college radio DJ; I "sang" in a couple of punk rock bands; I'd been an elementary school "class clown" who'd stay after school for the pleasure of making my peers laugh; I'd had many friends over my teens and twenties with whom I liked to "party"; and my career has been split up into parts as a customer service rep, in which I gabbed with people on the phone all day (and liked it), and a marketing dude, in which I've needed to be gregarious and outgoing and even a public speaker from time to time. So why did I keep scoring as an "introvert" on all those psychological tests the companies I worked for would throw at us as a means of understanding ourselves and our co-workers? And why did I find it so refreshing and necessary to be alone so often, up to and including going to films, rock shows and readings deliberately by myself? Why were my main hobbies all focused around solitary writing, reading or listening, and why did I actually physically recoil from airplane small talk, and from entering parties in which I didn't know anyone? Why did I even sometimes drive several miles to a party, and then leave before I entered; or pull a disappearing act when things got uncomfortable, and walk out without saying a thing to anyone? And why was (is) the idea of being a cross-country truck driver later in life, after I've made all my millions, so incredibly appealing? Because I'm a goddamn introvert, that's why. The "extrovert ideal" is a big one in Western culture. We're subliminally and explicitly encouraged to be "open", to generate charisma, to exude confidence and to never admit to "loner" tendencies, or god forbid, shyness. Susan Cain's excellent bestseller "QUIET: THE POWER OF INTROVERTS IN A WORLD THAT CAN'T STOP TALKING" takes on, and then dismantles, this mythos very effectively. You see, it turns out about a third to one half of us are introverts. Sure, we might have elements of our personalities that fall more on the extroversion scale than otherwise, and a lot of us - myself included - are not too bad at faking it. Yet I know who I am at the end of the day. I'm not shy, I'm not anti-social, and I'm not even "all up in my head" most of the time - but there's no question that without plentiful alone time and a retreat from noise and the social world, I will get extremely aggravated. Given a choice of doing something alone and doing it with people I don't know very well, I'll always very happily do it alone. Unless I'm with my family or close friends, I'd usually rather do my own thing. Always have, always will, I'm pretty certain. And I do in fact like and enjoy other people's company, and I hold no hostile positions vis-a-vis other people I don't know. Cain makes it clear that not only are there a ton of us like this out there, we express our introversion in different ways, and that we use numerous coping/covering mechanisms to get by in a society that explicitly values extroversion. For instance, I made myself learn how to speak in public, once a boss asked me to cover some trade show event for him. I'm not kidding when I tell you that the "fight-or-flight" trigger was so incredibly high that day, that five minutes before I was due on stage at a conference in San Jose, I very nearly walked out of the building and into my car. Yet, while I wouldn't say I "killed" on stage that day, I actually did all right, and have done as well most of the other times I've been up at a podium in front of an unknown crowd. I even kinda like it now, despite huge bouts of nerves and sweaty, low-level terror in the hours beforehand. 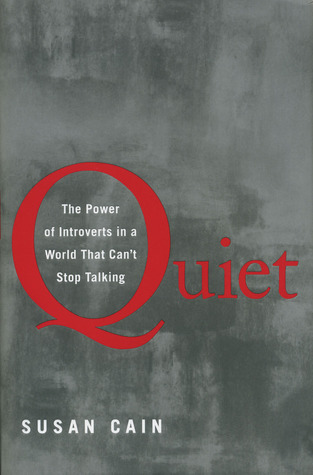 "QUIET" covers introversion not in a manner that marks it as superior to extroversion, but as a different and very key innate personality trait that should be valued and rewarded for its own merits. Turns out that thoughtful contemplation, deep thinking, modesty, deference and quiet competence has been responsible for some of the greatest art, thought, writing, ideas, inventions and even CEO-level leadership the world has ever known. Where you fall on the spectrum of introversion/extroversion has a ton to do with your DNA, no question about it - but the science is not conclusive about how much is nature and how much comes from nurture (i.e. your parenting and your early life). It appears that a parent can have a great deal to do with how well or poorly you approach any early shyness or withdrawn tendencies, and whether it becomes a pathology or a celebrated part of who you are as you get older. Cain looks at introversion from several angles in each successive chapter. There were two that really hit home for me, once her descriptions of my own personal behavior and makeup became so indisputable and spot-on that I have begun to proudly wear my introversion as a badge of friggin' honor. Damn right I'm a deep thinker! You want a piece of me? OK, after I finish being alone for an hour! Boom! First, Cain talked about the modern workplace. It has become very fashionable for well-meaning executives to pontificate about "the open office", in which cubicle walls are taken down and tables are instead arranged so that groups can sit together and "collaborate". The theory goes that if we remove barriers that keep us from communicating, we'll communicate more, and therefore be more productive and collaborative and, that's right, happier. No more soulless retreats into your own space. Now we all get to hang out together, all day, sometimes 10-11 hours a day! We're gonna be soooo productive! Of course, it doesn't work. Sure, the science and studies that Cain quotes doesn't totally debunk the idea that for some people, and some groups, more communication in the open is better than having to get up and walk to someone else's cube or office. Yet the distractions, the noise, the loss of privacy and so on are devastating for the productivity of many, introverts in particular. They/we have a much more difficult time processing multiple different-volume conversations, other people's music and our own work at the same time. Me, I can't even listen to music while I work or write, not even classical, jazz or dub, and if you've read this blog, you know I dig my music (and it would please me greatly, in theory, to be able to listen to more of it at work). Computer programmers often choose their line of work so that they can code in peace; they often prematurely quit jobs in which they're forced to share their work with others in close quarters, and in which they're distracted by people talking in and around them. I have worked in this sort of office before, and I can tell you that I mostly loathe it, and others with whom I work that are most similar to me in temperament do as well. There's a reason why self-purchased noise-cancelling headphones were de rigeur and extremely popular at the most recent office I've worked in that had an open floor plan. My other favorite chapter of Cain's book concerns Asian-Americans, and the question of whether introversion/extroversion is cultural. I think you know where I'm going with this. It absolutely is. She interviews multiple extremely successful Asian students in the heavily Asian enclave of Cupertino, CA, and what it's like for them to leave their 75% Asian high school, in which study and listening and deferred social gratification are paramount, and arrive at places like Harvard or UMass or Stanford, where class participation, group work and social bonding are highly rewarded. It's eye-opening stuff. The way that cultures developed in the West and East, and the way those cultures and norms are perpetuated to this day, is interesting in any case; to hear them explained along such a defining personality trait as introversion or extroversion is illuminating. For those of us that are parents, there's a good chapter near the end about raising introverted children. In my own case, I'm raising a kid that needs to occasionally be talked down from the ledge of extreme extroversion, so this chapter didn't help me except as a way to empathize with some of his friends and friends' parents who are working to encourage their children to be who they are, while carefully drawing them out of their proverbial shells. The lessons of the book, which I encourage you read if you're at all interested in something that's quite a bit deeper than pop psychology but not as intense as a doctoral seminar, are clear to me. To thine own self be true, number one. Regardless of the prevailing cultural norm, you are who you are (at this point in your life), and faking it for someone else's benefit can be much more painful and psychologically soul-rendering for you than it is beneficial to you in the long run. That said, lesson #2 is that we introverts all have various adaptations we can and should try on for size that will make our lives easier. Simply retreating in all cases is not an option, nor is it a desirable one for anybody. Funny enough, Cain calls out the internet as a place where so many of us have found a "voice", trite as it sounds, that happens to be an alternative to the social sphere of face-to-face communication. That's not always for the good, of course, but it allows many creative and interesting people to amplify their personas in ways that bring their true characters and ideas to life, in ways that would otherwise be hidden to the world. And if you're scoring as an "I" on those Myers-Briggs exams, don't worry about it. So did Bill Gates, George Orwell, Charles Darwin, Dr. Seuss, Audrey Hepburn, Albert Einstein, Meryl Streep, Steve Wozniak and David Letterman. They did OK.